riku to see if he approves of the plan or not. "I made a virtual Keyblade Graveyard. If you wish to know how it's like go there. I haven't been there in a while so it's not very updated. There are weapons in there for all of you but you can't leave the simulation with them...understand?" "Sounds good to me. ?axel says. "what do we have to do to get started? "looking towards Diz. "DiZ left me in charge of that." occ: the guy who uses DiZ is a friend of mine we were playing in the internet cafe but he left so he told me to take care of it. "Stand on those pads and i'll start the process." Axel looks to Riku onsure of what to do.then looks back,"Who's coming with me?" "I'll go after you of course. Riku will join us sooner or latter." "ok, I trust you. "Axel says as he walks towards the mechanism. 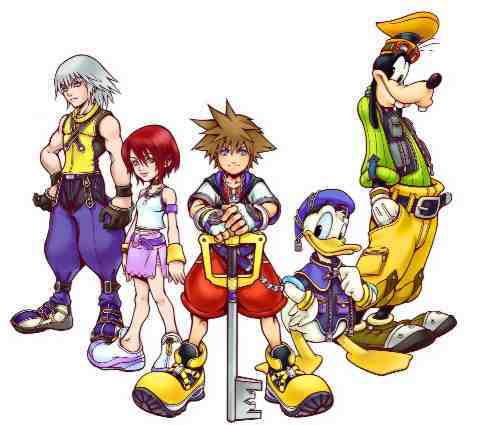 "I'll go, I need to practice with double keyblades I'm new to it..." Riku says walking toward the pads. "Ok." The machine begins to boot and virtualize Riku and Axel. "Now to make an auto virtualize for myself..."
Daimos reappears from the shadows and sees everyone walking towards a machine. "Now what could be going on here?" He asks and inspects the room. "ok, i am ready to go now....I think.Unless i'm in the wrong spot. 'Axel says as he stands on what he thinks to be the right pad. "oh we're gonna train in your virtual world, you comin with?" Daimos grins slightly. "Should be interesting...very well." He nods then steps onto one of the platforms. "Wow"Axel says taking a look at his hands it's almost as if there has been no change at all.This virtual world must have been well built." Relix thinks hard about the man he is working with and says with a frown, "That's DiZ for ya." Axel looks down and picks up a keyblade.."might take me a while to get used to these...Unless i can still use my regular weapons?" Daimos walks among the keyblades, looking at them as he walks along. "These keyblades...why does it feel like I have been here before?" Daimos thinks out loud. "Use whatever weapon you wish." Relix walks over to Way To Dawn and picks it up. "Nice." "good, because there is no way i could use one of these. "he throws it down, and to his suprise it comes straight back into his hands. "What is going on?" he says as he once again throws it down. "The theory is if a keybalde wielder loses a battle against another keyblade wielder, becomes over come by darkness, or dies the keyblade will come here. That is what the mean by the Keyblade Graveyard the place where keyblades rest when there bonds with there wielders are dead." "oh ok."Axel says"But why can't I get rid of this thing? "(throwing it down once again.